why do we need to measure the bangle size? this is the first thing to measure your bangle size, you have to consider your hand hardness and age if your hand is hard and age over 40, you might need to go larger 2 mm from the estimated size. 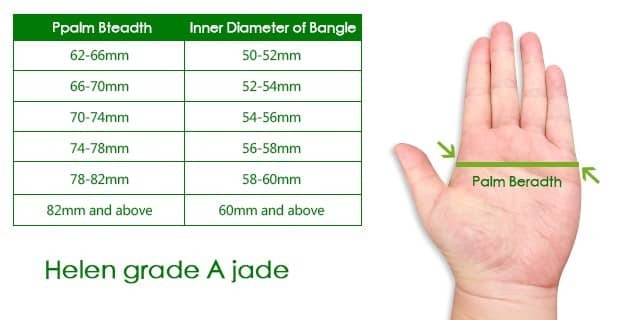 some young girls they have a soft and small hand, they can go down 1 mm, don’t measure your wrist, it is the wrong method for jade bangle size measuring. Sometimes a bangle doesn’t quite fit over your hand but is within feasible range to fit. If you want the bangle to be worn ‘for life’, here’s a few tricks we have to aid bangle fitting. As a reminder, the bangle may not come off (easily) once put on using these methods. Warning: your hand might hurt a little in the process. However, if your hand is in too much pain when using one of these methods, don’t exert yourself, it is possible that the bangle simply will not fit.